AJ has opened for many of the country’s top comedians including Damon Wayans, David Alan Grier, John Heffron, DC Benny, and SNL’s Jay Pharoah. He has been featured at some of NYC's top comedy clubs, including Caroline's on Broadway, in addition to regularly performing at various clubs and colleges across the country. 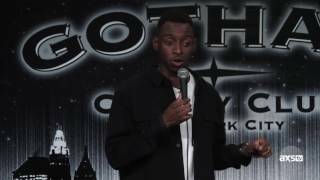 His television appearances include AXS TV's "Gotham Comedy Live", FOX's "LAUGHS", and MTV’s “Yo Momma”.In his young career, AJ has already experienced much success in several regional comedy competitions including champion of the 2014 Unforgettable Comedy Contest at the Syracuse Funny Bone, 2x runner up for the Funniest Person in Rochester Contest (2014, 2015), as well as runner up for 2014’s Last Comix Standing Competition at Foxwoods Resort and Casino. He was a featured performer or the 2015 Finger Lakes Comedy Festival and Semi-Finalists in the prestigious Boston Comedy Festival.